AIANTA has signed an agreement with the National Park Service to develop an educational guide chronicling the stories of the tribes—historic and current—located along the Anza Trail. ALBUQUERQUE, N.M. (November 14, 2018) – In October 1775—as American colonists were entering their sixth month of armed conflict against the Kingdom of Great Britain—more than 240 settlers from Mexico, led by Lt. Colonel Juan Bautista de Anza, began an arduous overland trek north to San Francisco. The 1,200-mile journey from New Spain (Mexico) to Alta (Upper) California, which in the United States stretches from Nogales, Arizona to San Francisco, California, lasted more than eight months, and traversed what today are some of California’s most popular roadways. The route, which can largely be navigated by automobile, has Historic Landmark signs dotted along the way highlighting key moments along the lengthy trek. While many of these markers chronicle European expansion into Western North America, the expedition history also very much belongs to the tribes and Native people the colonists met and interacted with along the way. Not just the story of Juan Bautista de Anza, the Anza Trail is also the story of Salvador Palma, a chieftain of Arizona’s Quechan (Yuma) Tribe, who helped guide the expedition, including leading the settlers to safety during a particularly difficult crossing of a raging Colorado River. It is the story of Salvador Linares, born on Christmas Eve 1775, during an unexpectedly harsh snowstorm in the California desert area now known as Anza Borrego Desert State Park. Although Linares has been reported as one of the first non-Native children born in present-day California, like one third of the expedition party, he was actually of mixed race, born to an Indio (converted native) father and a Spanish mother. The Anza Trail also tells the stories of dozens of Arizona and California Tribes, including that of the Chumash, a coastal people who make their home near the Pacific Ocean in what is now Ventura and Santa Barbara counties. A seafaring people, the Chumash impressed the Spanish settlers with their Temescals (sweathouses), Tomols (sturdy coastal boats) and their advanced commerce system. For the Ohlone people, the seasonal village of Chutchui is an integral site for the Anza expedition, as this is where the colonists made their San Francisco camp. Chutchui would become the site of San Francisco’s famed Mission San Francisco de Asís (Mission Dolores), which was first established in June 1776, five days before Eastern colonists signed the Declaration of Independence. Built largely using Native labor, the Mission continues to house San Francisco’s oldest surviving building. In partnership with the National Park Service, the American Indian Alaska Native Tourism Association will find and tell the stories of the Southern Arizona, Southern California, Central California and Northern California tribes associated with the trail. Over a three-year period, AIANTA will conduct interviews and make site visits to eight major tribal intersections along the route, while also working with tribes located within 100 miles of the trail. Ultimately, the organization will produce a printed guidebook interpreting the trail through the stories of the tribes along the way. The organization is currently seeking an experienced freelance writer to assist with the project. AIANTA undertook a similar project in 2014, when it was tasked by the National Park Service Route 66 Corridor Preservation Program with interpreting the tribal offerings along famed Route 66. In 2016, AIANTA released the “American Indians & Route 66” guidebook and an accompanying website. Tribes interested in being included in the guide should contact Gail Chehak at gchehak@aianta.org. 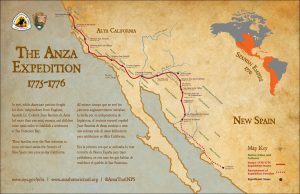 Download a map of the Anza Expedition and images from the Anza Trail here. 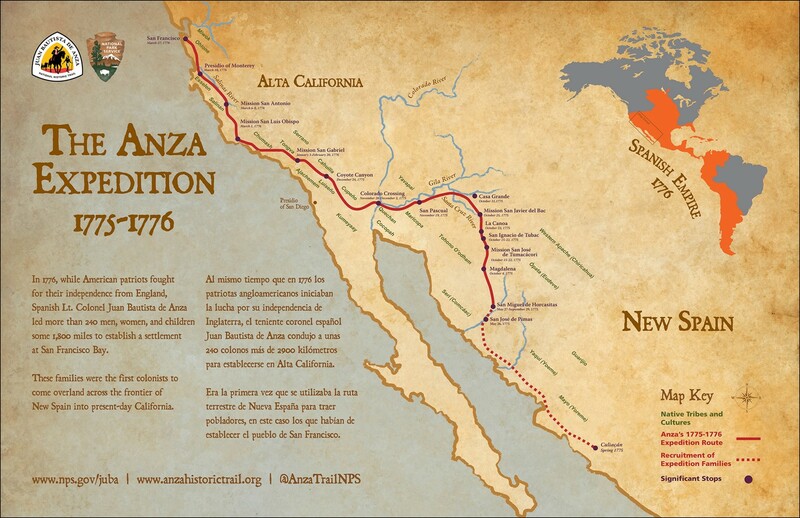 As a unit of the National Park Service, the Anza Trail connects history, culture and outdoor recreation along a 1,200-mile corridor from Nogales, Arizona, to the San Francisco Bay Area. For 2018, the National Park Service has developed a year-long celebration of the 50th anniversary of the National Trails System—including the Anza Trail—which was signed into law by President Lyndon B. Johnson in 1968. For more than two decades, the American Indian Alaska Native Tourism Association (AIANTA) has served as the national center for providing tourism and recreational travel technical assistance, training and capacity building to American Indian nations. AIANTA is a 501(c)(3) national nonprofit association of Native American tribes and tribal businesses and was incorporated in 2002 to advance Indian Country tourism. AIANTA’s mission is to define, introduce, grow and sustain American Indian and Alaska Native tourism that honors traditions and values.